The ladies of Dallas Black Dance Theatre strut their stuff in Margo Sappington’s Step Out of Love, part of the company’s Director’s Choice Series. Dallas — Just when you think you have seen everything in Dallas Black Dance Theatre’s (DBDT) movement arsenal the company comes out with something bigger and bolder. Last season DBDT soared to new heights in Jamal Story’s aerial work What to Say? Sketches of Echo and Narcissus at its Spring Celebration Series. This year the ladies of DBDT are getting down and physical in Margo Sappington’s hard-hitting, jazz funk piece, Step Out of Love, part of the company’s annual Director’s Choice Series, Nov.6-8, at the Dee and Charles Wyly Theatre at the AT&T Performing Arts Center in the Dallas Arts District. A Texas native, Sappington began her professional dance career when she joined the Joffrey Ballet at the age of 17 and her choreographic career at the age of 21. In the U.S. her choeography has been used by companies such as Joffrey Ballet (New York/Chicago), Pennsylvania Ballet, Houston Ballet, Atlanta Ballet, Kansas City Ballet, Milwaukee Ballet, Carolina Ballet, Hubbard Street Dance Chicago and Ballet Jazz de Montreal. In 1975 Sappington was nominated for a Tony Award for her work on the play Where’s Charley? and in 2005 received a Lifetime Achievement Award for choreography from the Joffrey. Sappington is most well-known for using popular music on the concert stage, including songs by Prince, William Shatner, Indigo Girls and Carlos Santana. Her opera credits include Live from the San Francisco Opera, La Gioconda, Samson and Delilah and Aida. On Broadway, she was the dance captain in the original Promises, Promises and has choreographed revivals of Pal Joey, Oh! Calcutta! and Where’s Charley? For example, Alyssa Harrington showcases her uncertainty about the break-up through a series of soft and hard body shapes and various controlled leg extensions. Michelle Herbert’s anger is palpable in her explosive barrel turns, sudden falls to the ground and aggressive hand gestures, including claps, flicks and jabs. Hana Delong and McKinley Willis (who was standing in for Jasmine White-Killins) let out their frustration with large traveling steps, frantic arms swings and sudden stop action moments. Unlike the others, Kayah Franklin appears to be the one initiating the break up as is evident through her dismissive body language and the sly smirk on her face. 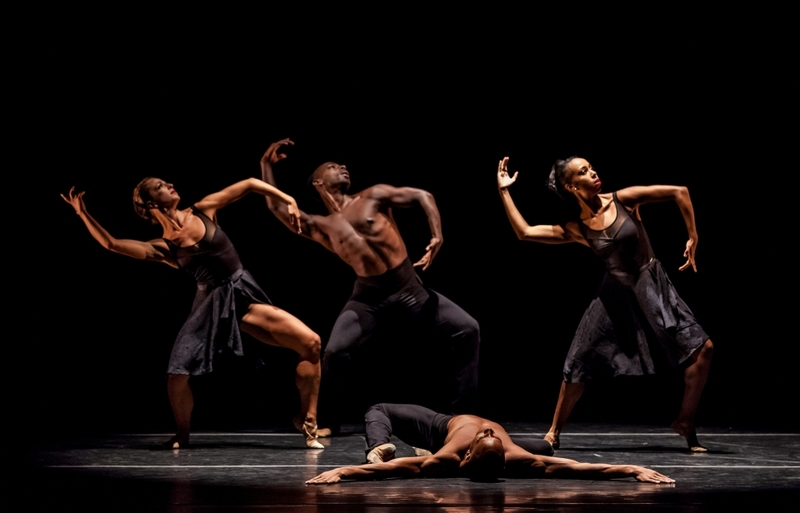 Audiences can see Sappington’s Step Out of Love along with Alvin Ailey dancer Hope Boykin’s in·ter·pret, Christopher L. Huggins’ Night Run and Talley Beatty’s A Rag, A Bone, and A Hank of Hair at Dallas Black Dance Theatre’s Director’s Choice Series, Nov. 6-8, at the Wyly Theatre. Dallas Black Dance Theatre II pushes itself physically and emotionally in Artistic Director Nycole Ray’s Opaque, part of DanceFest 2015 this weekend. 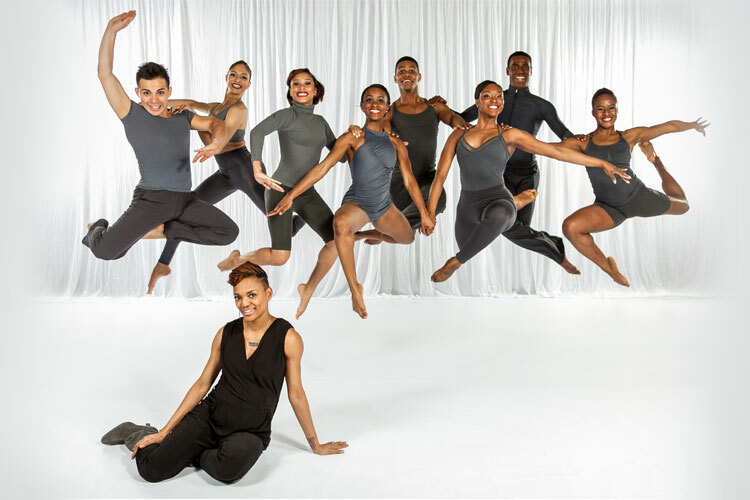 Dallas — Starting out as a student-driven secondary company formed in 2000 by Dallas Black Dance Theatre Founder Ann Williams, Dallas Black Dance Theatre II (DBDT II) has flourished into a high caliber performance troupe made up of eight young and hungry semi-professionals from all over the place. This year’s troupe alone includes dancers from Washington, D.C., Chicago, Mexico and Jamaica. Every dancer has a unique story of how they became involved with DBDT II that they readily shared with me when I stopped by Dallas Black Dance Theatre’s (DBDT) main studio last Thursday to watch them prepare for the upcoming Dallas DanceFest. With that goal in mind Ray is constantly challenging the dancers by introducing them to a variety of movement styles and choreographers, including Christopher L. Huggins, Bruce Wood, Ray Mercer, Dianne Grigsby, Cleo Parker Robinson and DBDT company member Richard A. Freeman, Jr. DBDT II’s touring schedule has included stops in South Carolina, Oklahoma, Louisiana, Virginia and Arkansas. Internationally the company has travelled to Ireland, South Africa, Austria and Peru, just to name a few. Ray says the company is very excited to add Mexico and Chile to their touring schedule this year. When it comes to her own choreography Ray says she likes to challenge the dancers physically and emotionally, which comes across in abundance in her aptly titled work Opaque. “The piece is about things not always being transparent no matter how much you want them to be. The thought process stems from a person and not so happy feelings, which then evolved into something that made me feel good and positive.” You get a sense of this optimism through the dancers’ lifted upper bodies, unyielding trust in one another and purposeful use of each dancer’s (male and female) long, black skirts. “The skirts purposely cover the dancers’ feet to create this illusion that they are floating while also reflecting on the theme of transparency and what you can’t see.” The skirts are not just for ambiance. The dancers use them throughout the work as extensions of their bodies, links to one another in one section where they unravel across the stage and even for extra resistance in the partnering sequences. The effect is dramatic, yet not overdone. » The second Dallas DanceFest is Sept. 4-6. Performances will take place on Friday and Saturday night at 8 p.m. with the 2015 Dance Council Honors awards ceremony and performance showcase occurring on Sunday afternoon. Ann Williams reflects on her time as artistic director of Dallas Black Dance Theatre, the company’s impact on the Dallas community and her plans for the future. Dallas — Teacher. Mentor. Dream maker. These are only a few of the titles Ann Williams has acquired over the past 37 years as founder/artistic director of Dallas Black Dance Theatre, the oldest, continuously operating professional dance company in Dallas. But after the company’s Spring Celebration Performance at the Winspear Opera House this weekend Williams will hand the reigns over and take on a new title: retiree. The two-evening Spring Celebration includes performances by Anita N. Martinez Ballet Folklorico, Bruce Wood Dance Project, Texas Ballet Theater and Kirven Douthit-Boyd (Alvin Ailey American Dance Theater). Dancers from DBDT will also be performing in new works choreographed Lily Weiss (Booker T. Washington HSPVA) and Christopher Vo (dancer on Season 2 of the NBC show SMASH). Since starting the company in 1976, Williams has established five performing dance troupes and currently employs 12 administrative staff and 12 dancers on an 11-month contract. DBDT has performed in 14 countries with tours in Peru, South Africa, Uganda, Austria, Japan, Italy and many more. Most notable venues include Lincoln Center in New York City, The Kennedy Center in Washington, D.C., the 1996 Olympic Games in Atlanta and the 2012 London Olympics. DBDT’s repertoire includes works by Alvin Ailey, Ulysses Dove, Talley Beatty, Christopher Huggins, David Parsons and Darryl B. Sneed, to name a few. Christopher Vo pushes Dallas Black Dance Theatre mentally in his new work touch (listen), part of the company’s Spring Celebration, honoring the legacy of Ann Williams. 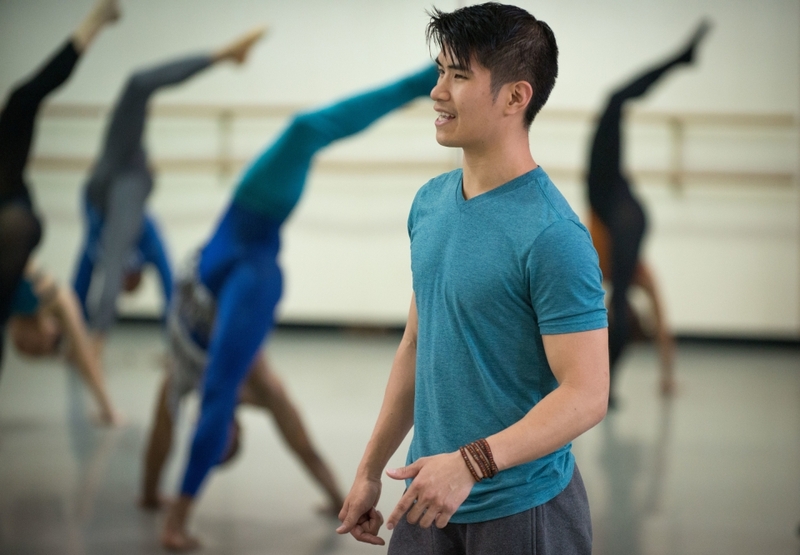 Dallas – “Remember guys, calm, easy and mindful,” says choreographer Christopher Vo to the members of Dallas Black Dance Theatre as they prepare to run through his new work, touch (listen), last Friday afternoon. In this piece Vo challenges the dancers to be more impulsive and alert in their movement choices. A Dallas native, Vo attended Booker T. Washington High School for the Performing and Visual Arts before being accepted to the Juilliard School in New York. From 2008 to 2011 Vo toured and taught master classes across the country with the Lar Lubovitch Dance Company. He was also a principal dancer in Twyla Tharp’s Come Fly Awaydance musical and was a featured dancer throughout Season 2 of the NBC show SMASH. In 2013 Vo performed in the world premiere of the Bruce Wood Dance Project’s My Brother’s Keeper and also headlined Dance Planet 17, a free dance event the Dance Council of North Texas puts on every year. touch (listen) begins with six couples lounging stoically on the ground. At the start of the music they slowly inch backwards across the floor. One by one the dancers stand and begin running. As the violin swells and descends the dancers spontaneously break into pairs, trios and quartets creating visually pleasing lines and rotating formations as they go. While finishing the dance Vo asked the dancers several times to just go with the flow rather than give them specific pathways. “In this section I want you to be less creative here (Vo points to his head) and just go with the momentum.” But he still expects the dancers to be mindful of where everyone is spatially. This is especially crucial when there are two groups on stage rotating clockwise with the purpose of joining together in one straight line at the end. Viewers will certainly notice if one group’s timing is off. 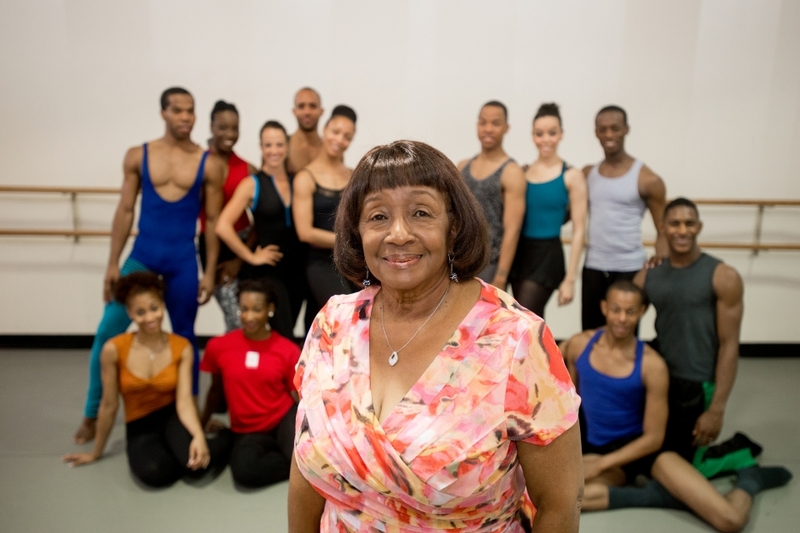 Dallas Black Dance Theatre’s Spring Celebration Performance, which honors the legacy of founder Ann Williams, is May 16-17, 2014 at the Winspear Opera House. In addition to Vo, the program also includes DBDT performing works by Bruce Wood and Lily Weiss (Booker T. Washington HSPVA), and features guest performances by Anita N. Martinez Ballet Folklorico, Bruce Wood Dance Project, Texas Ballet Theater and guest performer Kirven Douthit-Boyd of Alvin Ailey American Dance Theater.